I had planned a couple of more blog entries before my holiday to Italy, but I've got distracted. So before I disappear for a week, here are some thoughts on the IPL and cricket scheduling. This is a bit of a change from my usual fare, but since everyone's talking about the IPL and its consequences, I thought it was worth sharing. I am a big supporter of the IPL, and I hope it's a big success. But there is one big danger that I see, and that's if it expands too much. This year, the IPL teams will play in a double round-robin — fourteen matches each — before semi-finals and final. There's huge scope to make the tournament bigger. Teams in Major League Baseball (where games last about as long as T20's) play 162 games a season. Now I'm not saying that anyone wants a cricket tournament in which each team plays 162 times, but the point is clear: the IPL could get much bigger. I've done some scribbling, and I think that Test cricket can survive in much its present form as long as the IPL season is not longer than four months. IPL Teams could play, say, five games a fortnight, and so the home-and-away season could be around 35 matches per team, which would be followed by a finals series. To make it concrete, let's assume that the IPL could fill up February to May. Three-Test tours would be truncated after the third Test. It should be clear what my thoughts on first-class tour matches are! There are no one-day matches, though you could probably squeeze one or two in either at the beginning or at the end. Or you could shorten the tour matches, or get rid of one, to make space. The Ashes stay on a four-year cycle, and everyone else is on five-year cycles. This could easily be relaxed to six-year cycles. The non-England teams could be shuffled around from winter to summer, depending on other schedules or commercial considerations. Other countries may also want five-Test series (they'd be good with India-Pakistan, etc. ), but they'll have to be able to host Tests outside of the October to January window, have touring teams accept the loss of some tour match days, or the loss of rest days between matches. The other alternative (probably the more reasonable one) is to have six-year cycles. This is obviously a bit Utopian (and I've ignored the Champions League), but it least it shows in principle that things can all work out. I should be back blogging next Monday or Tuesday. Sorry for the delay in updating — I've just got back from a short holiday in Amsterdam. On Tuesday morning I'm heading off to Florence and Rome, so there'll be another break in posting soon. I had a question on whether Indian players were valued more than non-Indians in the IPL auction. The answer is that they were, by about $250k each. My analysis is a bit rough, since I didn't want to get bogged down in details in the couple of days I have before Italy. Firstly, it's important to note that it's not a free market — there were requirements on young players, international players, icon players would have distorted the market, etc. But we'll see what the numbers tell us. I took all the non-icon players who had ODI stats (or, failing that, List A stats) that included batting strike rate. Because it seemed a reasonable thing to do, I gave each player a batting rating, defined as the batting average multiplied by the strike rate, divided by 100, divided by 20 (roughly). For bowlers (and I chose bowlers by looking at them and deciding whether I'd consider their bowling in buying them; there's a grey area of course, but for most players it's pretty obvious) I gave a bowling rating: bowling average times economy rate, divided by 6, divided by 25. I might be biasing the ratings towards batsmen or towards bowlers, but it shouldn't be too bad. Then I added the batting and bowling ratings for an overall player rating. I put three other variables into the regression model: number of matches (a bit dodgy in one or two cases, where I used List A rather than ODI's), and dummy variables for Indians and wicket-keepers. I probably should have done something about the Australians and West Indians, who are only available for half the tournament, but I couldn't be bothered. - There is a slight positive correlation between matches (i.e., experience) and salary. For every hundred extra ODI's, the salary goes up by about $65000. - My hastily calculated player ratings are positively correlated with salary. Increase the batting average (times strike rate) by 10, your salary goes up by $80000. - If you're Indian, you get a bonus $265000. Indian cricketers can expect to be part of marketing campaigns. - Wicket-keepers get an extra $135000, and I'll ignore the p value which tells me that it's not significant. The extra money they get is expected, since I didn't incorporate wicket-keeping skills into the player ratings. - These factors explain 25% of the statistical variance, which is 50% of the salaries in cricket terms. Now just for a bit of fun, I decided to use the player ratings to work out how many dollars each team spent per player rating point. I've fixed it so that the teams are on a scale of 3 to 9, so that I can compare with Q. The conclusion here is that at least one of me and Q has no idea what we're doing. Of course, my analysis is based purely on ODI numbers (possibly out of date — several people have said that T20 is a young man's game, with the play very fast), whereas Q's looked at T20 form and crowd-drawing power. Even so! I suspect the difference of our ratings of Jaipur is that they didn't actually spend much money on players. So they got quality for what they spent, but the overall team isn't all that good. The point of the bidding process is to get the best team (including marketing, etc. ), not to get the most player rating points per dollar. This is Part 9, and also the final instalment, in my series on first-class cricket in the 1800's in England. In this post I look at wicket-keepers. I've decided to focus on pure wicket-keeping, and so I've ignored batting. It's a bit boring-listy, but there's a graph below all the tables. Many of the early scorecards do not indicate who the wicket-keeper was. If there were one or more stumpings, whoever effected the first one was deemed as the keeper. I don't think that this is much of a problem in terms of the tables below, since most of the record-getters played once the scorecards became more complete. Nevertheless, there are probably minor errors, since sometimes teams change wicket-keepers, and I've allocated all the innings byes to the first one (that I know of). To begin, let's have a look at the leading keepers by dismissal in the 1800's. The last column is the percentage of team runs conceded as byes. Mordecai Sherwin tops the list. He was, amusingly, a keeper in both cricket and professional soccer. Both Hunter brothers make the top ten. The leader in terms of dismissals per match (with at least 20 matches) is Charles Smith at 2,69. Behind him are Pilling and Pooley. Fred Huish, early in his career, was showing signs of his greatness as a wicket-keeper. He figures prominently in the next table, which shows the leading keepers by number of dismissals for all first-class matches in England. I've added an extra column — byes per 600 balls. Players from the 19th century are in bold. Huish never played a Test match, mostly because of Bert Strudwick, two places ahead of him on that table. Bob Taylor is the leader all-time, as we would expect (since he holds the overall first-class record). My last two tables show a curious phenomenon. The first has the leading keepers by byes percentage. Qualification for both: 60 matches. Now Bob Stephenson moves up to first, part of a general movement of 1960's keepers up the rankings. It would appear as though he was unlucky not to play a Test, but with his career coinciding with Taylor's and Alan Knott's, he was kept in county cricket. I'm guessing that the difference between byes percentage and byes per 600 balls is due to batsmen hitting the ball more often in the 1980's, so that less balls got through to the keeper. Ideally, we'd have a "byes per balls that passed the batsmen". It should be possible to come up with a correction factor based on the run rate (so that you'd use run rate as a proxy for balls hit), but I haven't tried to do so, and in the absence of ball-by-ball data I don't know how accurate it would be. We know the number of overs in about 95% of the innings that Tom Lockyer kept. In these, he averaged just under 10 byes ber 600 balls, almost exactly the same as Paul Nixon. I don't want to do era adjustments for wicket-keepers. The balance between bat and ball can change, and so averages should be adjusted accordingly to get comparisons of talent levels. But letting through byes shouldn't change much with eras of low scoring. Still, you might want an idea of how far away from the average keeper of the era someone like Lockyer was, so here's a graph showing the overall byes percentage for each season. There's a lot of early noise because of the low number of matches. 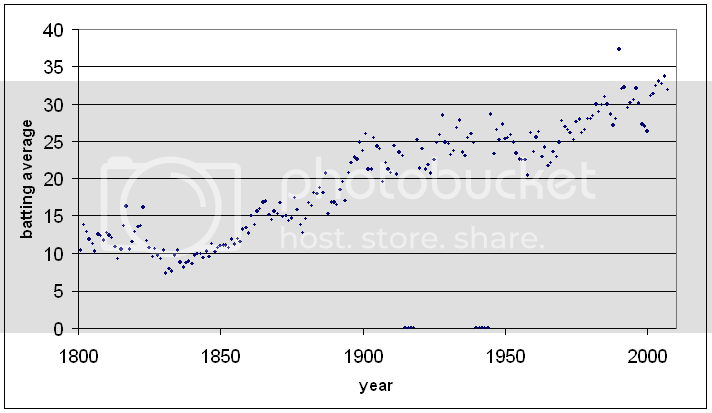 There's a huge peak in the era of very low scoring around the 1830's. This isn't just because the byes were constant and the runs were decreasing — there's a peak in the byes per match as well, suggesting that keepers had just as much trouble with the round-arm bowling on those pitches as batsmen did. Noteworthy are the jumps that follow the World Wars, telling us that keepers were out of practice and skill levels had dropped. 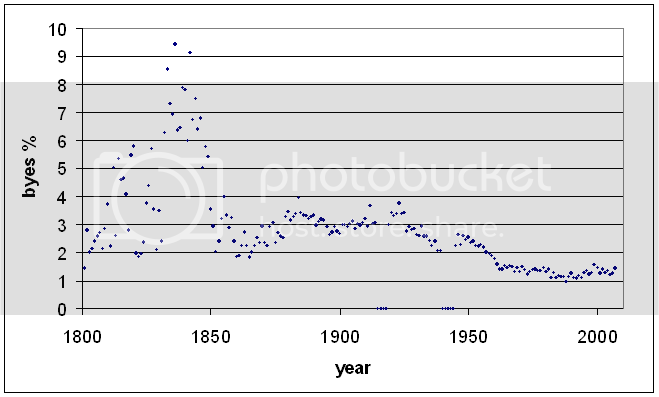 The general trend after World War II was downward until about 1990, when it starts to rise again, presumably when teams started giving more importance to keepers' batting ability. Looking pre-World-War-I, there are a couple of phases whose causes I don't know. There is a clear rise from the 1860's to the 1880's, before it starts to fall again and then noisily flatten out in around 1900. And that's the end of this post and this series on 1800's first-class cricket in England. Thanks to anyone who actually read it all. One of the problems in comparing bowlers from different teams is that they often have different levels of support. This is a recurring theme in Murali v Warne debates (in between expletive-laden rages) — Murali took more wickets per Test, but that was because Warne followed McGrath and Gillespie, and Murali only ever had Vaas. Warne had it easier, and that makes Murali's low average more remarkable. But maybe the batsmen didn't try to score as much against Murali, because they could pick off runs easily at the other end. The debate can go on and on, and it's not clear which factors are the most important. So I asked myself the question, if you swapped the two bowlers between the two teams, what would their records be? You can't answer this question perfectly, of course, but you can try. For each innings in which the bowler bowled, I defined the support average as the mean of the averages of the four bowlers who bowled the most overs in that innings (three bowlers if the bowler himself would have been one of the four). Note that, unless otherwise stated, the averages used are averages in which each wicket is weighted in proportion to the batting average of the batsman dismissed. I use end-of-career averages (to make my life easier and the numerics more stable). The support average of bowler A is (24 + 33 + 31)/3 = 29,33. The support average of bowler E is (25 + 24 + 33 + 31)/4 = 28,25. To do the analysis, for each bowler I took all innings and sorted them by support average. I then binned them into quartiles (to reduce the noise and make for easier interpretation), that is, the quarter of innings with the lowest support averages, the quarter with the next lowest support averages, and so on. Then for each quartile I calculated the bowler's average, and also the average support average, with the latter weighted by the number of balls bowled in each innings (so that, for instance, an innings where the bowler only bowled one over would barely be counted). You can see that Murali's support average is indeed much higher than Warne's, as you would expect. I don't know how much I want to read into individual trends — four data points, even aggregated ones, aren't a lot. That won't stop me trying. The overall trend for Warne is for his average to increase as his support gets weaker. In particular, for the upper quartile (the only one near where Murali has to bowl) his average is the highest, getting close to 30. Murali seems to turn it on when he has no-one to support him at all. How about another pair, this time from the 1980's? When Marshall didn't have Croft, Garner, Roberts, and/or Holding around him, he was still awesome. It seems that Gillespie did actually do pretty well when McGrath wasn't around, and it was McGrath who got worse (a little bit) when he didn't have support. Well, perhaps — it could just be an artifact of McGrath's career trajectory, I haven't checked. These are all well and good, but we'd like to do a bit more serious analysis with them. If you fit a regression line to an individual player, you can get a rough guide of how their average will change when the support gets better or worse. While it might be dubious to do this for just one player, if you do it for all players, the noise should largely cancel out and we'll be left with some solid numbers. So, I took all bowlers with 100 Test wickest at at least 3 wickets per Test, calculated the slope of the regression line for each, and then took the mean of the slopes. The result was 0,50. That's a pretty hefty figure. It means that, on average, if the support average goes down by a run, then the bowler's average will go down by half a run. But it's inflated by the presence of some outliers. If you exclude players with less than 50 Tests (remember that we're dealing with quartiles here, so you need a large number of Tests to get reasonable quartile results), that figure drops to 0,25. So if the support average drops by four runs, the bowler's average drops by one run, on average. You might be wondering if there's a correlation between average and the regression slope. There isn't. The scatterplot is equal parts scatter and plot. No trend emerges if you make the qualification 50 Tests to get rid of the outliers. I tried a few other variables, but I couldn't find anything with an R-squared of better than about 0,004. Even in cricket terms, none of them explained more than 7% of the data. This is Part 8 in my series on first-class cricket in the 1800's in England. In this post, I look at all-rounders. As I did for Test cricketers, I'll be ranking players by the ratio of batting average to bowling average, where the averages are weighted as in Parts 6 and 7. Let's start, as always, with the 1800's. The averages below are with respect to 16,6, the overall average for the period in question. The +/- percentage figure applies both to the bowling average (well, technically it applies to the regular bowling average; I fondly hope that it's accurate for the weighted average) and (by a trick of mathematics) to the ratio as well. I've given the wickets per match for those interested; recall that these are underestimates for bowlers whose wicket tallies are estimated. Qualifications: 2000 runs and at least two (regular) wickets per match. Lambert's pretty clear at the top. Beauclerk is mildly ahead of WG Grace and Allan Steel, but the uncertainty means that all wa can say is that he's likely to be somewhere between second and sixth. Before I started on this extended exercise in analysing old English players, I didn't know much at all about the cricketers of the era, apart from WG Grace. One name I did know was Alfred Mynn, rated by John Woodcock as the fourth-greatest cricketer of all time. Now, Woodcock's list has lots of problems (most notably, WG Grace is number one, ahead of Bradman), but I was interested to see how Mynn would fare after adjusting for eras. He comes in at number seven (plus or minus one) on the table above. But if (as might have happened) Woodcock ignored cricket before 1830, then you can see what his method was — he chose near the top all-rounders with huge aggregates. Mynn was not a special batsman, but he was a prolific wicket-taker, even if his bowling average wasn't remarkable for his time. Add in his popularity, and his dominance of single-wicket matches, and you can see where Woodcock was coming from, even if number four is too high. Now let's move onto all first-class cricket in England. Players whose career began in the 1800's are in bold. Averages are with respect to 24,5. Keith Miller comes out on top, ahead of (surprisingly) the Big Ship Warwick Armstrong. Lambert leads a host of 19th century players, who are vastly over-represented in the table — almost half of the top thirty spots! Given the number of players since 1900, you'd expect only about five or six from the 1800's. Alfred Mynn is a long way down the table (20th place), but if you give more weighting to wickets per match, he would be higher. At number nine is Frank Tarrant, someone I'd never heard of. He never played a Test, which, at first glance, is extraordinary for someone with his first-class record. His lack of Test cricket is explained by his being Australian and playing for Middlesex, which barred him from playing for Australia (though he did play for the MCC at times). The abundance of 19th century all-rounders tells us something about the nature of the game and/or its players. I'm not sure exactly what factors contributed to it, but I would suggest the following. When cricket was less developed, and had fewer top-level players, a talented athlete was more likely to dominate with both bat and ball. As batting and bowling techniques became more sophisticated, and the number of players increased, there were more specialists in both disciplines, making it harder for the talented cricketer to be good (relative to his peers) with both bat and ball. Next up (and the last instalment in this series): wicket-keepers. The statistical judging of all-rounders is usually not done in what I would consider a satisfactory way. I'm not really going to remedy this problem in this post, though I will present some ranked lists. It's more a case of looking at the stats and seeing why it's hard to get them to agree well with common sense (without making some arbitrary decisions). I'll only be considering batsman-bowler all-rounders. If you want to comment about wicket-keepers, it should be about Tim Zoehrer. The base of this analysis will be the bowling averages with wickets weighted by the batting averages of the batsmen dismissed, and the batting averages with runs weighted by the strength of the bowling attack. This gives a comparison across all eras, and rewards those players who performed well against stronger sides. Both the averages I use in this post are normalised to 31,48, which is the overall batting average for all Tests. All references to averages below are these weighted averages. My main ranking tool will be the batting average divided by the bowling average. I prefer this to the difference, which is more commonly used, because I think it gets closer to a definition of "all-rounder-ness". So, for instance, a batting average of 60 and a bowling average of 30 gives a ratio of 2. A batting average of 40 and a bowling average of 20 also gives a ratio of 2. I think this is fair — in the first case, you have an all-time great batsman who was a good bowler, and in the second you have an all-time great bowler who was a good batsman. You might think that one is a better player than the other, but I'm trying to get at the all-rounder-ness. I hope that's clear. So, let's think of what qualities we'd like and qualifications we'll use in ranking the best genuine all-rounders of all time. The top seven all-rounders of all time are then as follows. (Runs and wickets are the regular runs and wickets; wpm is wickets per match; ratio is the ratio of batting average to bowling average). Why only seven? Because that's all there is. No other players satisfy those four conditions above. I'm actually pretty happy with that list. It's obviously not the list of the best all-rounders ever, but as a list of the most all-rounder of all-rounders, I think it works. Keith Miller just beats Imran Khan as the best ever. Now let's remove requirements 3 and 4 above and see what we get. Now Sobers returns to number one, which is where most judges would put him. You can see why he missed out on the previous list — his bowling wasn't that good. Despite an average in the mid-30's (both weighted and regular), he was actually a very economical bowler. A high average and low economy rate (2,22) means that his strike rate was appallingly bad, over 90. Not the go-to man if you need a wicket! But he's generally considered the second-greatest ever player because no other great batsman could bowl so well. Even if "so well" is not so well. The cut-off of 2 wickets per Test is pretty arbitrary, and it would be unfair to stop here, because it would exclude Jacques Kallis. For my last table, I've lowered the bar to just 1 wicket per Test. This means that a bunch of part-timers are included. While it would be silly to consider them as being as good as the more regular wicket-takers given here, the stats must tell some story — perhaps it suggests that they were underbowled, or perhaps they were just lucky and dismissed a few good batsmen from time to time. And Kallis actually slots in at number one! Bob Cowper, with his part-time offies, will probably suprise most of you (it surprised me, even though I was vaguely aware of his handy bowling). Andrew Symonds' career is definitely on the improve. His regular bowling average is now under 35. That his weighted bowling average is just over 28 tells us that he's dismissing some good batsmen. So there you go. I don't know what features you'd want in an ideal ranking of all-rounders. You could set boundary of 2 wickets per Test, and penalise players (such as Kallis) who take less wickets, but setting the boundary would be arbitrary. Charles Davis, when rating bowlers, actually gives equal weighting to wickets per Test and bowling average. While I see the arguments for doing so (and it would eliminate the problem of setting that boundary), I still like to fall back on the average, so as not to unduly reward bowlers with no support. This is Part 7 in my series on first-class cricket in the 1800's in England. In this post, I do a comparison of batsmen across eras, by weighting each innings by the strength of the bowling attack. 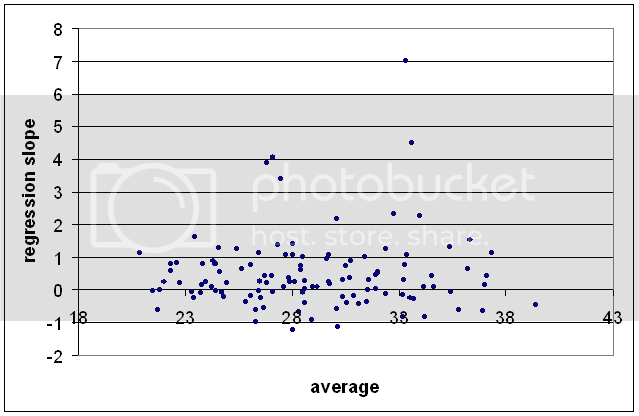 The latter is taken as the "average average" of the bowlers in an innings, weighted by the number of balls bowled by each. (You can see the results for Test matches here.) The same effects (only now for batsmen) occur here as in the weighted bowling averages in Part 6 — batsmen are rewarded for scoring runs against better bowling attacks, and batsmen in low-scoring eras are rewarded because typically the bowlers will have correspondingly low averages. For innings where the bowlers' overs are not recorded, I've instead used the overall batting average for that season. I couldn't see an easy way of getting an unbiased estimate of the bowling strength, when we don't know who bowled. Using the season average will in general inflate the modified batting average (since typically a batsman will score more heavily against weaker attacks, but using the season average counts that as the same as scoring against a strong attack). But for the players near the top of the tables below, this is not so likely — these batsmen tend to "rise to the occasion" and perform disproportionately better against stronger bowling attacks. Nevertheless, perhaps you might want to put a mental asterisk next to players whose careers included matches from before 1855. Also, some of the bowling averages are estimates (even where we know the overs bowled), so some of the weighted averages should only be given to one decimal place. But I'm getting lazy. There's a lot of noise in the early years because not many first-class matches were played (sometimes only one). The lowest-scoring season was 1831, when the average of runs off the bat (that is, excluding extras) was just 7,35. You can have a look at the scorecards for that season here. To start our comparisons of batsmen, we look at just the 1800's. I've given the weighted runs, regular average, and (once again) two weighted averages, one with respect to 16,6 (the overall average for the 1800's) and one with respect to 24,5 (the overall average from 1801 to 2007). One is just a scaling of the other. Qualification: 2000 runs. Ranji's high average wasn't just because batting was getting easier towards the end of the century — even allowing for that he still comes out on top. Once again, Robert Poore's lucky, since his career went downhill after he fought in the Boer War. Fuller Pilch was described a few years after his retirement as the best batsman ever, and he kept this tag until WG Grace came along. From the little I've read about him, he seems to be the first man to consistently get his foot to the pitch of the ball. In an era where pitches were of very low quality, smothering any turn or uneven bounce was very important. It's worth commenting on the discrepancy between the rankings in the table (i.e., Pilch ahead of Grace) and the opinion of the time (Grace ahead of Pilch). Grace was considered a better batsman than Pilch because he could play attacking shots off a wider range of deliveries. But since Grace's innovations to batting technique spread to the other cricketers of the time, he didn't stand out as much as Pilch — scoring for most batsman improved after Grace. It is sad that Nicholas Felix is so called, since his actual surname was Wanostrocht. He wanted to be known as Felix, but Wanostrocht is such a cool name for a cricketer that I've gone against his wishes in these tables. In addition to being an excellent batsman in a low-scoring era, he also invented a type of bowling machine. Now let's compare batsmen in England across all eras. I was unsure as to how useful this would be — we all know of batsmen who have excellent records in domestic cricket but do terribly in Tests. But weighting runs by the strength of the bowling attack does a pretty good job in discarding that breed of batsman. Of course, it also doesn't allow for players such as Marcus Trescothick, who have mediocre county records but respectable Test numbers. Players who played in the 1800's are in bold. The top spot should be pretty uncontroversial. Vijay Merchant is at number four — he is perhaps not famous enough for having the second-highest first-class average of all time (71,64). Pilch slots in at five, followed by a string of Australians. You'll note that WG Grace fell significantly in the years between 1899 and his retirement in 1908. It's that old story of a player hanging on too long. Thirty-five years of first-class cricket and he still wanted another decade. Beauclerk and Lambert, those all-round giants of the first quarter of the 19th century, just miss out on the top ten. Jimmy Cook is perhaps the oddest name in the list. He was a South African who played most of his career during isolation in South Africa, but played three seasons with Somerset before retiring. He did get to play three Test matches. Imagine a scorecard in which each batsman's score is less than the previous one. So, for example, the first opener scores 131, the second 82, the number three makes 75, the number four makes 56, and so on. What would you guess is the longest such sequence of declining scores in a Test innings? What would you guess is the longest increasing sequence? These are, I admit, not the most important questions in cricket, but I found them fun. I would have thought that, while a long decreasing sequence would be rare, once you hit number 7 and the tail it should common enough to get down to number eight or nine. The problem is that once a batsman makes a duck, the sequence has to stop, so it'd be pretty unlikely to get all the way to number eleven. An increasing sequence should be rarer, but perhaps when a captain reversed his batting order on a sticky wicket, you could get a sequence up to seven or so. Certainly I thought the longest increasing sequence would be shorter than the longest decreasing sequence. As it happens, the longest increasing sequence goes to number six, but so does the longest decreasing sequence! Decreasing sequences: Eng v Aus, 1905, Eng v SA, 1955, Aus v Eng, 1990/1, Zim v NZ, 1992/3. Increasing sequences: Aus v Eng, 1884/5, Aus v Eng, 1932/3, Eng v WI, 1957. If you allow a score to be equal to the previous score, the longest non-decreasing sequences still only go down to number six, but there are two non-increasing sequences to number 7: SA v Aus, 1949/50, Eng v Aus, 1977. Decreasing: Lancs v Middlesex, 1913, Lancs v Glamorgan, 1928, Wales v Minor Counties, 1930, Yorks v Lancs, 1952, Kent v Surrey, 1988. Increasing: Lancs v Kent, 1988. The Kent v Surrey innings (Surrey's first) is actually non-increasing right the way down to number eleven (it finishes with three ducks and a nought not out). There are two other cases of non-increasing sequences from one to eleven: Yorks v Lancs, 1888 (finishes with five ducks and a nought not out), Gloucs v Leics, 1929. The longest non-decreasing sequence is still eight. Is there a way we could have guessed how rare these sequences are? Any maths-phobes may wish to stop reading now. There's some calculus below. A naïve approach would be to say that, since each score is either higher or lower than the previous one, it's just like flipping a coin. (Not exactly: it could be equal, but it'd be pretty close.) What's the probability of getting seven heads in a row? One in 128. But there have been over 1800 Test matches, so sequences of length seven should have occurred dozens of times! The error in the above reasoning is at the start: it's not like flipping a coin. The first step is (the second opener could be higher or lower than the first, with a close to 50% chance each way), but after that, it's no longer 50-50. Suppose the first opener makes 40. It might be 50-50 as to whether the second opener scores less than 40. He might make 30, say. But then the probability that the number three will score less than 30 is less than 50%. If he makes 20, the chance that the number four will make less than this is even smaller than the previous probability, and so on. A better way would be to assume that individual innings follow an exponential distribution, which says that scores of 0 are more common than scores of 1, which are more common than scores of 2, etc. (This isn't real distribution — in reality it's quite skewed towards zero — but it's a reasonable approximation for these fun purposes. Also, the runs are scored in discrete units — 1, 2, 3, etc. — but the exponential distribution allows for any positive real number of runs, such as sqrt(2) or 4.9.) Assume further (to make the maths easier) that each batsman has the same average. Sorry for the ugly formatting. That's the integral from 0 to x of k*exp(-k*s) with respect to s.
Now we evaluate these integrals! Trust me when I say that, when you expand it all out, most of the terms cancel, and you're left with a term that comes from integrating the exponentials which multiply together, so that the probability is 1/n!. So, a decreasing sequence of length six should happen about once every 720 innings, a sequence of length seven about once every 5040 innings, and a sequence of length 8 about once every 40320 innings. Essentially the same argument gives the same probabilities for increasing sequences. It's not perfect (and we wouldn't expect it to be so, given that the real distribution isn't exponential, and batsmen's averages aren't all equal), but it gets the right order of magnitude at least. It gives us a good idea of why we haven't seen a sequence of length seven in Test cricket yet, though we should get one eventually, perhaps in the next ten or twenty years. This is Part 6 in my series on first-class cricket in the 1800's in England. In this post, I do a comparison of bowlers across eras, by weighting each wicket that a bowler takes by the batting average of the batsman dismissed. (You can see the results for Test matches here.) This has two effects. The first is that bowlers who dismiss the best batsmen are rewarded for doing so (and bowlers who just pick up tailenders are punished). The second is that, since in an era of low scoring, most batsmen will have proportionally lower averages (and vice versa), the resulting weighted averages will be comparable across eras. For scorecards where the caught etc. wickets are estimated rather than known, each "fractional wicket" is weighted by the batting average times the fraction. For these scorecards, the bowler will still be rewarded for bowling the best batsmen, but after that, he is simply rewarded for doing well against teams with good batsmen who he might have dismissed. In each of the tables below, I give the wickets, weighted wickets, runs conceded, the usual average, and then two resulting weighted averages (one being just a scaling of the other). One is with respect to 16,6 (the overall average for the 1800's), and one is with respect to 24,1 (the overall average from 1801 to 2007). First up, the top bowlers from the 1800's, as ordered by the weighted average. Qualification: 200 wickets. It's also good to see that this analysis puts Tom Richardson as the top Englishmen of the 1800's. He was considered the best fast bowler of all time at his peak, which lasted from 1893 to 1897. A young Wilfred Rhodes gets into fourth spot, based on his spectacular first two seasons of county cricket. The absence of bowlers from the first part of the century is explained by there not being many matches played. Only a handful of players played a decent number of matches (that is, enough to reach 200 wickets), and most of these were batsmen or all-rounders. That James Broadbridge, James Cobbett et al. are missing from the top of the table is more of a surprise. It seems that, while the round-arm era saw the lowest scoring in first-class history, none of the bowlers really stood out. They had spectacular averages, but so did everyone else at the time. (It is also possible that some of the bowlers would be higher if the wickets were known — perhaps some dismissed more top-order batsmen than the estimations give them). Broadbridge is 49th, with a weighted average of 14,2 with respect to 16,6. Alfred Mynn is a long way down the table (94th; weighted average 15,9 wrt 16,6). Now let us move on to the comparison for all time. Players whose first-class careers started in the 1800's are in bold. A good cross-section of eras and countries is represented, with Murali leading the pack. Hedley Verity is, suprisingly enough, the top English bowler, and George Freeman sneaks into the top 20. It is curious that SF Barnes is so far down the list (number 21). When I did this exercise for Test bowlers, he was the best for anyone with 100 wickets. In amongst international stars, there are a couple of surprising names. Bob Appleyard, who bowled both off-breaks and fast-medium, is the first of these. He may well have become a great of the game had it not been for a terrible run of illness (including being diagnosed with TB) and injury. His rise for Yorkshire was spectacular, as he took 200 wickets in his first full season. But after just nine Tests (in which he took 31 wickets at under 18), his fall was just as spectacular. Douglas Carr played just one Test for England in 1909. His career ended with the outbreak of war, but it surprises me that he didn't get any more Tests. Les Jackson was also unlucky, being selected only twice for England. In an era when England had less pacemen, he probably would have played more international cricket. Big Jim Smith is best remembered for his slogging (he once hit a half-century in eleven minutes), but his numbers suggest that he could have done well as a Test bowler. As it is, he got just five Tests, taking 15 wickets at 26,2. I suppose that if he had played some Tests against Bradman, his figures might not look so good. Next up: cross-era comparisons of batsmen. This is Part 5 in my series on cricket in the 1800's in England. This post is nothing statistically special — just a few lists of batsmen. Batting data for first-class cricket is essentially complete, so there's no need for fancy estimation techniques for calculating averages etc. The leading batting averages for the 1800's come exclusively from players who played near the end of the century, when batting became easier. Qualification (for all tables in this post): 2000 runs. Robert Poore's pretty lucky that I stopped at 1899. In his last season of cricket before fighting in the Boer War, he scored a triple century and averaged over 90. When he returned to first-class cricket in 1902, he did not return to those heights, and his first-class career finished with an average under 40. Ranjitsinhji, on the other hand, was able to sustain his average, and indeed it finished over 56 (with a Test average in the mid-40's as well). Joe Darling is the first Australian to make any of these lists. His presence arises from his scores in the Australian tours of England in 1896 and 1899. Now let's look at the leading batsmen by runs scored. We see that WG Grace, as well as taking comfortably more wickets than anyone else, scored more than twice as many first-class runs in England than any other batsman in the 1800's! Of course, he did play many more matches (second on that list is George Ulyett with 499), but you can see how he was such a giant of the game, and why he remains famous to this day. Beauclerk and Lambert we met in Part 4. Billy Beldham (whose photograph you can see here) perhaps played his best cricket in the late 18th century, in matches that are not classified as first-class. He is credited with being a founder of what might be called proto-modern batting technique. Batting has evolved a long way since then! While Beldham and his contemporaries stepped forward to meet the ball, it would take about another half-century before batsmen played attacking strokes off either the front foot or the back, and strokes off the pads were developed by Ranji late close to 1900. Robert Robinson is a rather anonymous figure as far as the Internet is concerned. I haven't managed to find much out about him, despite him having been one of the leading batsmen of the day. He also played in the 18th century, and scored a century in his first important match for which CricketArchive has a full scorecard (Kent v Hampshire, 1792). Next up: Adjusting bowling averages for era and the quality of wickets taken.